BRICS plan to overthrow Hollywood monopoly with own "Oscars"
Members of the festival's jury and organizing committee at the First International Film Festival of the BRICS countries in New Delhi, India. Brazil, Russia, India, China and South Africa (BRICS) are on their way to building closer cultural ties. The first BRICS film festival is part of their preparation to overthrow the monopoly of Hollywood. 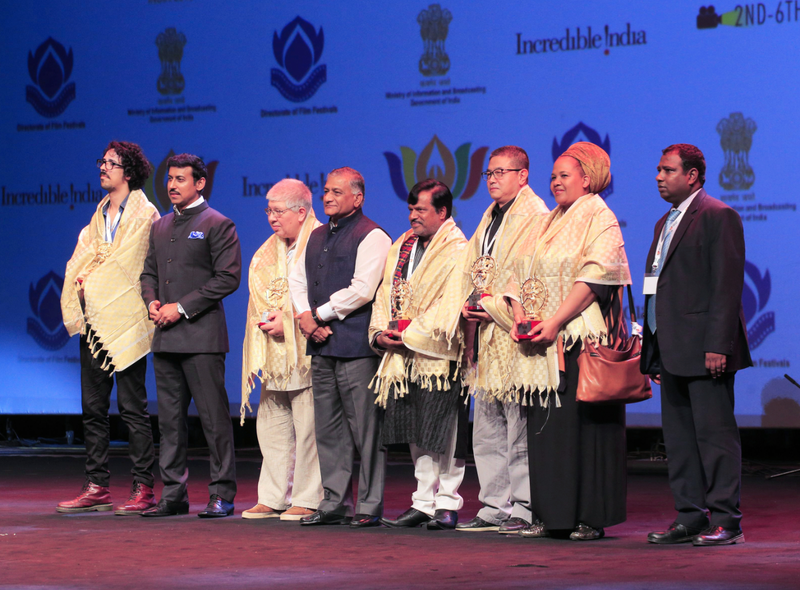 India was the host for the first BRICS Film Festival, after Indian Prime Minister Narendra Modi initiated the idea of having a forum of Films at the BRICS summit in Ufa in the summer of 2015. India is the current chair the BRICS and is hosting all BRICS events. The format of the festival allowed the audience to get acquainted with the latest films from the five countries in a few days. Attendance at the shows was high, halls were often "crammed to the eyeballs", and some viewers even had to stand to watch some of the movies. Among the movies which played to a packed house was the youth melodrama "14+" by Russian director Andrei Zaitsev. Despite the fact that almost all the films were shown in the original language with subtitles, the films were warmly received by the Indian audience. "It's a great movie. These topics are very close and dear to us, one can find something close to himself in them", said Mahendra Kumar the RIR, one of the film’s spectators. There were 20 films in the Competitive section of the Festival; four per country. “Thithi,” an Indian dramatic comedy, won the main festival prize for the best film. It depicts how three generations of Indians from a clan react to the death of an elder. The honour of Russian cinema was upheld by the movie "About Love" by Anna Melikyan, "The Battle of Sevastopol" by Sergei Mokritskiy, "The Best Day" by Zhora Kryzhovnikov, and "14+" by Andrei Zaitsev. Julia Peresild of Russia was named best actress for her role in the film "The Battle of Sevastopol". The jury named the South African, Thabo Rametsi, as best actor for his role in "Kalushi". The Chinese director Huo Tszyantsi was named best director for the film Xuanzang. The Jury’s Special Prize went to the Brazilian film "Among the Valleys" by Philippe Barsinski. Two other Russian films did not go unnoticed by the jury. The film "14+" by Zaitsev and the documentary "Tolstoy and Mahatma Gandhi: a double portrait in the interior of the age" by Galina and Anna Yevtushenko, which was not in the competition segment, received special mentions. The festival ended with a performance by Chinese artists and the film "The Trail," a joint production by China and the United States, with Jackie Chan in the lead role. The choice of such a programme for the closing ceremony is logical, since the next country to chair the BRICS will be China and the next Film Festival will take place in China. Rivalry with Hollywood, and an "Oscar" for BRICS? The idea of ​​the festival, the organizers stressed, is to contribute to the growth of mutual understanding among people of BRICS countries. Cinema is among the best ways to promote people-to-people understanding. "This promotes cultural exchange, understanding of each other, and understanding of each other's culture. The film festival is a factor that cements ties between the countries. Cinema is the best method of communication, to impact on people's views," said Venkaiah Naidu, India’s Minister for Information & Broadcasting. The BRICS film festival has another goal: to create an alternative site for cinema which does not conform to ‘Western’ standards. Xoliswa Sitholi, a jury member from South Africa, responded unequivocally to a question on whether the BRICS have decided to create an alternative "Oscar": "BRICS is the future, forget the rest," she said. "What we need is the political will of each country to adopt a protectionist approach to their films and work. France has done that. I have no doubt that in 15 years’ time, the BRICS will be at a place where everyone will be aiming for," she said. Kirill Razlogov, a film critic and jury member representing Russia, drew attention to the need for co-production. "If we can establish a co-production, it will be good. Co-production is the only way to the world screen. In Europe, the level of co-production is 80%, in Russia it is about 5%. These figures speak for themselves," he said. Minister Naidu noted that India is already making films together with China and Brazil. "We are excited about this and are really considering the possibility of signing similar agreements with Russia and the Republic of South Africa," Naidu said at the closing ceremony. Razlogov believes the festival could be considered a success, and one with a good future. A common film market for Russia, India and China? "In my opinion, it was rather successful, it established some relationships within the five large countries, where there is a strong cinematography, and a large audience. I think that this cause has a future," he said at the end of the festival. He noted that "Russian films were welcomed surprisingly well, but with varying degrees of enthusiasm. Therefore, this opens up some prospects for release if they are dubbed in Hindi. Let's see what happens," he said. Russia took active part in the festival. "The Day of Russia" on September 3 was celebrated as part of the festival, with actors from the variety theatre, "Leningrad Centre" performing the "Russian Dreams" programme. The show, which included elements of various entertainment genres, was well received by the audience. Russian cuisine was available in the food court organised for the Festival. Pancakes with caviar, buckwheat cakes and ‘kvass’ were among the dishes available. A souvenir market with goods from Russia was also set up at the Siri Fort. Only Russia and India were represented at the food court and the souvenir outlet, making it one of the few downsides of the Festival.